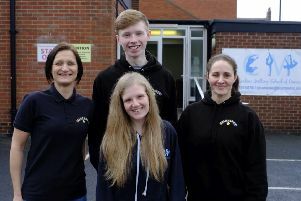 (l-r) Kirsty Hart, of Cargo Creative; Tess Wilkinson, from Making Research Better; Calum Robson; Vivien Spencer, from North Tyneside hospital; and Chris Elliott, of Making Research Better. An artistic youngster is seeing his talents go on show for all to see at a hospital. Calum Robson won a competition at North Tyneside General Hospital to design a new children’s logo for a leading clinical research organisation. The 10-year-old’s striking design for Making Research Better – the North East and North Cumbrian representatives for the National Institute for Health Research (NIHR) – was a finalist in the region-wide competition. His design for the new logo has been framed and will now go on show at the hospital. Calum, who lives in Holystone, had only spotted the competition by chance as his six-year-old sister, Sophie, has to make regular visits to the children’s outpatients at the hospital. Calum, who had been off school that day due to his feeling unwell, went along with his sister and mum, Jacqueline, for Sophie’s regular check up. The Holystone Primary School pupil said: “I really enjoy drawing and colouring, so when I saw the details of the competition, I thought I’d give it a go. “I’ve never won anything before, so when they called my mam to tell her I’d won, I was really excited. “The aim of the competition was to give children’s clinical research a necessary brand identity of its own; something that patients, their families and the general public can identify as a source of the highest quality, reliable and important work. Calum’s striking design was named one of four winners to beat off competition from more than 80 other entries from eight hospitals across the North East and Cumbria. The competition was devised and managed by Making Research Better’s delivery partners, Cargo Creative. Anna Telfer, matron for children’s services at Northumbria Healthcare NHS Foundation Trust which runs North Tyneside General Hospital, said: “We’d like to congratulate Calum on his winning design – it’s absolutely superb. As well as seeing his design go up in the hospital, Calum also secured a £20 Amazon voucher, kindly donated by Cargo Creative. The competition was launched during NIHR’s recent NIHR@10 campaign, marking their tenth anniversary of facilitating research that helps answer questions for the NHS.